It’s been a very interesting last few weeks around my house and things are finally starting to wind down. This is my first post of the New Year and first post of the month so I decided to write about something that has been relevant to me as of late: genre. I’m presently writing a mystery/thriller. I’m only calling it that because it seems I need to place it under some genre, and by definitions I’ve read, my story seems to be heading that direction. I read a book last year about writing and there was an entire chapter about all the various genres and sub-genres within works of fiction. We tend to compartmentalize everything and I was not surprised to find anything different in the writing world. Looking at the majority of what I have read in the past, most of it would fall under some sub-genre of mystery or thriller. That doesn’t mean I don’t like other genres, it just means mysteries and thrillers are my favorites. Much like hard rock is my favorite music despite listening to everything from Ice Cube to Johnny Cash. I tend to be that way with most things in life. Mexican food is my favorite but I enjoy most any ethnic food. Action movies? I love them. December however is devoted to both traditional Christmas movies and sappy Hallmark Channel Christmas movies. One of my favorite movies of all time is an inspirational movie called “Rudy” about a kid’s dream of not only attending Notre Dame but playing football there. Another is a silly kid’s movie called “The Goonies.” Neither of those is an action movie but for whatever reason are two of my favorites. A few years ago, my oldest son asked me to read Eragon, a book he was reading by a very young author named Christopher Paolini. It’s about a dragon rider and his dragon and I couldn’t honestly say without some research what genre it falls under. I remember laughing at first, saying a very polite “no, that’s not my thing” and most likely continued reading the next available Daniel Silva or John Grisham book. My son was persistent and before I knew it, I was hooked on The Inheritance Cycle by Paolini, an amazingly well written series by the way for such a young author. Last year, at my son’s urging, I did the same thing with The Hunger Games. I think if we limit categories in our reading, or listening, or tasting, or watching, we miss out on so much of what it is out there. I’ve thought about that a little over the last month as I read two new books over the Christmas/New Years Holiday. Both books were not in my chosen genre to write in; one a wonderful NA (and no that’s not Narcotics Anonymous) book about vampires and the other a contemporary romance about a second chance romance. Both were wonderful, well written stories by two very talented writers I am lucky to have as friends. Although I read them purely for pleasure, there were takeaways with each, both with style and two different approaches to romantic scenes. I’m glad I ventured out of my comfort zone years ago when it came to reading. I do it with everything else in life so it should be no surprise that I’ve done it with reading. I know that reading books in my genre helps make me a better writer within that genre, obviously important with my current project but I’m also convinced reading anything makes me a better writer. It’s a craft, and like most any craft, it can be expanded and improved upon by stepping out of your comfort zone and experiencing other genres. Do I need to pick a genre? For writing, I believe I do but only because I have a grand master plan. For reading? Absolutely not. How about you? Do you have a favorite genre to read and/or write? Sounds like my musical tastes. I’ve gotten to be the same with reading though I tend to go through spells where I prefer one over the other. This post is really relevant to me right now, Bill. My last two books (only books!) are in the women’s fiction genre, but one is more like chick lit and the other is closer to literary fiction. Now I’m writing a story that I hope is still women’s fiction (master plan, you know?) but one of the two main characters is a 60-yr-old male ham radio operator. And when I tell that to most women, their eyes don’t exactly light up with excitement. As for reading, I read everything. Like you, I’ve read books recommended by my kids, as well as lots of non-fiction, mysteries, literary fiction, and of course, women’s fiction. And it’s funny, because almost every book seems to incorporate at least two genres, in one way or another. So sad that we compartmentalize so much, but I guess it’s necessary for marketing. Anyway, once again, thank you for an interesting, insightful post! This is so true Bill. I have had the same experience with my daughter, being ever so slightly dismissive of books she recommended I read because they weren’t the normal sort of book I read. I found I was very wrong when I eventually gave them a chance and I haven’t looked back since. Particularly over the last year, since I published my first book I’ve read a wider range of books than ever before and that has been incredibly useful for my own writing as well as opening my eyes much more to what is possible. I do really hate pigeon-holing my own books in a genre though – I know it’s necessary but I try to write something that crosses borders of genre and therefore it becomes tricky. I’ve noticed that once I became more serious about writing, my reading tastes expanded. So much talent out there across many genres! Great post!! My reading interests vary, especially now that I have become part of the indie world. I used to stick to reading memoirs but over the last three years, I’ve come to enjoy a wide range of genres. My writing, so far, is non-fiction but that’s not to say I don’t have an idea for a novel tumbling around in the back of my head. I suppose we’ll see what happens. Write on, friend. After reading your blog for a few months now, I would suggest you have an amazing amount of material to draw from for a work of fiction. Think of how much fun you could have with it! Excellent post, Bill. I couldn’t agree more. I’m a romance junkie of all varieties, but I like to venture out to other genres, too. I think good writing from any source can be utilized to make us better writers. My son recommended The Hunger Games to me as well. It was kind of cool to be able to discuss books with him, especially since he tends to lean towards his dad’s interest. We did that too! 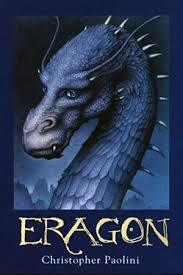 When I read the whole Eragon series, my son was constantly want to discuss the book with me every couple of chapters. I loved it. I read just about all genres. I’m getting there and enjoying the variety. Fun post! I, too, am primarily a mystery/thriller reader. But I enjoy discovering new genres and will also dip my toes into YA when my teenager recommends I read a book she enjoyed. These days, I’m in classics mode – have started “Bleak House” by Dickens and am thoroughly enjoying traveling back in time through his prose. I’ve slowly read classics over the years. Some not by choice but found I enjoyed them anyways. So many great books to choose from. Reading the two of you was a must for me and am proud of the both of you! Until this last year, most authors I have read have been well known, best sellers, etc. I’m glad I’ve found new authors, both Indie and published, this last year. I like to equate this to music. There is a lot of great music we all hear on the radio or TV but some of the best music will only be heard by a few. That doesn’t take away from the skill or heart those lesser known musicians demonstrate. Some make it, some don’t, but to the artist all that matters is the art.